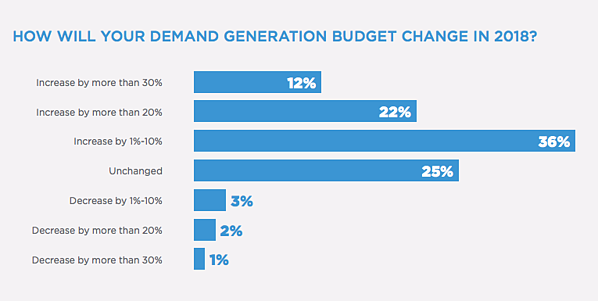 70% of marketers expect an increase in demand generation budgets in 2018, according to the Demand Generation Survey. At the same time, overall marketing budgets are shrinking (as per Gartner’s 2017-2018 CMO Spend Survey). Last year, marketing budgets claimed 11.3% of overall company revenue, down from 12.2% compared to 2016. So why would B2B demand generation marketers grow their spend while the rest of us are bracing for a cut? And how are marketers planning to allocate their marketing budget to increase ROI? Source: Demand Generation Survey. Most demand generation marketers are expecting their budgets to increase in 2018. Let’s look at the key marketing trends that may offer some insight into this curious phenomenon. The data shows that while the budgets are going up to support more personalized campaigns and higher spend on digital, B2B marketers will be held to higher standards of measurement. tl;dr: more money will come with greater accountability. 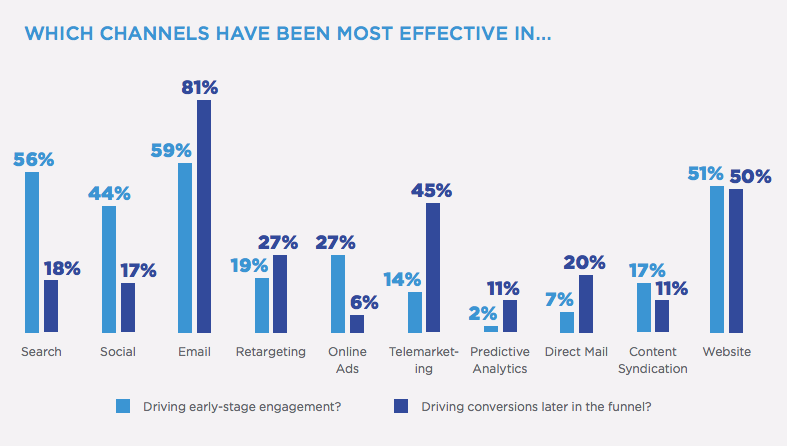 This year, more marketers see revenue as their key metric. The number of marketers who said they have specific revenue-based quota increased from 23% in 2017 to 28% in 2018. 91% of demand generation marketers surveyed for the report say that they track their revenue contribution to the company. And for a good reason: that contribution is growing! When asked what percentage of revenue is attributed to marketing-sourced leads, 28% of marketers said between 26% and 50%. As you can see, the demand generation budget increase comes with weighty expectations for delivering on deeper-funnel metrics and conversion goals such as revenue. Source: Demand Generation Survey. Budget raise comes with higher expectations for delivering on the most important business metrics. Less than 2% of marketers are measured on web traffic, while most only eye the metrics that directly contribute to the bottom line -- such as SALs (sales accepted leads), a metric that counts the number of potential customers whom both marketing and sales teams consider “a fit” for their business, based on a variety of criteria such as budget, need, and the prospects’ timeline for making the investment. How you report on marketing spend to the higher-ups will likely change. Because CMOs today are under more scrutiny for delivering ROI (or so says Gartner), paid marketing teams will be tasked with measuring the full-funnel impact of their campaigns. 73% of marketers consider lead quality their priority for 2018. Targeting high-value customers in 2018 will mean that marketers may have to rely on more expensive marketing techniques. Take events, for example. 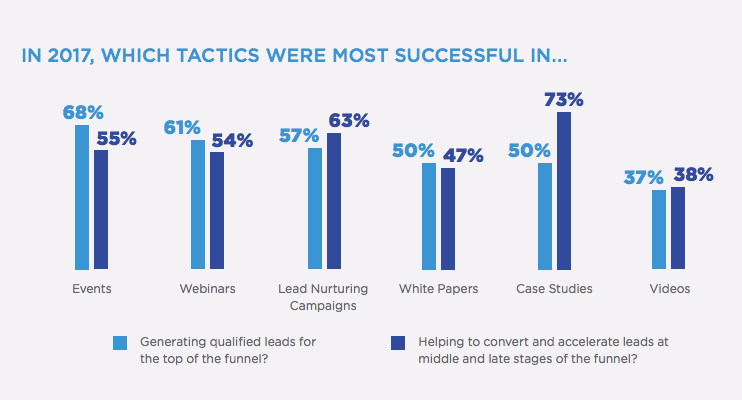 68% of marketers use events to generate qualified leads for the top of the funnel, according to the report. Trade shows, seminars, and summits take up a large portion of B2B marketing budgets. Even virtual events and webinars require a significant investment if you consider technology, sponsored speakers, and promotion. Content, even though still “ROI-amazing” according to Brian Balfour of the ProfitWell Report, is also getting more expensive to produce as demand for good content marketers exceeds supply, Digiday reported. Source: Demand Generation Survey. Event and content marketing are the most effective demand generation tactics. Whether or not you're considering an ABM strategy, you'll likely shift your marketing budget around to test new channels. Be prepared to set up your tracking to account for multiple marketing touches, online and off. Your marketing dashboard should reflect the dollars in/dollars out for each channel, whether it's a Facebook campaign or a steak dinner. 8 out of 10 of the most effective demand generation channels are digital, and the top 3 of them are, again, all digital: email, search, and website. Digital ad spending reached $209 billion worldwide and is expected to grow by 13 percent this year. As a relatively new marketing function, demand gen encompasses many marketing activities, with lead generation perhaps being key. B2B prospects are online, empowered with all the information that was earlier unavailable or hidden under the “contact sales” form-fills. So naturally, demand gen marketers will be investing more money to have relevant information ready and accessible at every stage of the buyer’s journey -- and tracking the impact across different channels to close the loop between ad spend and revenue. As your digital spend grows, you will need to consolidate all your paid marketing data in a single dashboard with easy access to granular metrics. This is important not only to have a central view for cross-network PPC reporting, but also to spot trends and find opportunities to improve. So, while the overall marketing budget growth is stalling, businesses will keep spending more on activities that generate incremental revenue. If the trend for unifying sales and marketing under a single revenue metric is to continue, demand gen teams are poised to grab the largest slice of the marketing budget pie in the years to come.